Coat color genetics can be very confusing. There are many different genes that can contribute to the overall coat color in a dog and for each gene, there can be different mutations that can contribute to color variations. 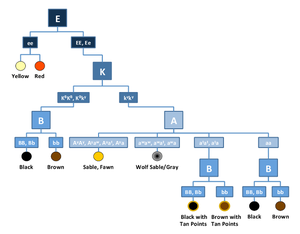 The B locus (or gene) is responsible for many of the brown coat colors seen in dogs (also referred to as chocolate or red, depending on the breed). When performing genetic testing of the B locus, the test result is determined by examining three specific locations within the B gene of a dog, known as the bc, bd, and bs. 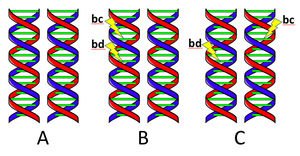 The overall B locus genotype for a dog is determined by the combination of genotypes (variations) present at the bc, bd, and bs loci (locations within the B gene).